A Nationalist MSP has lodged a motion in parliament calling for Berwick-upon-Tweed to "return to the fold". An unofficial vote is taking place in the English borders town asking locals whether they want to switch from England to being part of Scotland. The town, which is near the Scottish border, has changed hands between the two countries at least 13 times. And Berwick Rangers play in the Scottish football league. South of Scotland MSP Christine Grahame has lodged a motion at Holyrood urging people in Berwick-upon-Tweed to "return to the fold". It even urges Scottish ministers to begin negotiations with Westminster to secure Berwick-upon-Tweed's "restoration" as part of Scotland. A television debate and vote is being held for the ITV Tonight show to gauge local views on becoming part of Scotland again. Ms Grahame said the progress of the SNP Government north of the border was making the prospect "very appealing" to residents in the town. "I think there is clearly support for returning the historic port town and placing it under Scottish jurisdiction," she said. "The last vote held on this issue was lost by only a very small margin and it is clear from the feedback so far that Berwickers are seeing the benefits fellow Scots are getting by securing more control over our own affairs. "Even the Berwick-upon-Tweed Borough Council leader, who is a Liberal Democrat, backs the idea and others see the merits of reunification with Scotland. "That is very welcome indeed." The MSP claims that "Berwickers" have seen their status and taxes "drain" southwards towards London with little benefit flowing back. 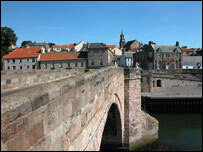 "We would welcome Berwick-upon-Tweed's return with open arms," she said. Ms Grahame's motion already has the backing of fellow Nationalist MSPs.